Nearly every day I check the Amazon Kindle eBooks page to see what's free that day. Amazon has a continually changing "shelf" of ebooks for which they do not charge. Every once in a while, a big name book will appear there as part of a promotion. For instance, just before Inferno came out, Amazon offered The Da Vinci Code for no cost for a few days. Most days I do not find anything worthwhile, but occasionally I stumble onto something interesting. 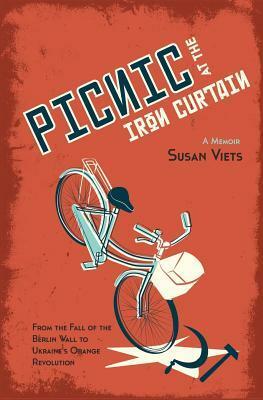 Picnic at the Iron Curtain caught my attention right away. I am a self-confessed history junkie, but more recent history is something I am only just now starting to enjoy. Things that happened in the second half of the twentieth century, such as the Charles Manson murders, the Iranian revolution, and the descent of North Korea, either had not yet made it into my high school history textbooks or were too close to the end for my teachers to ever make it that far. Now, as an adult, I have taken it upon myself to get educated on events that are still shaping our world. The events of Picnic happened in my lifetime. That either means I am getting old or that the history that Susan Viets witnessed are still recent enough to be relevant. I'm going with both options. Viets' memoir follows roughly a decade of her life reporting on events in Eastern Europe. In the late 1980s, she began a career in journalism behind the Iron Curtain. She lived in Ukraine and Hungary primarily. In that era few Western journalists had posts in these countries and Viets became a part of a very small community of journalists there. She witnessed the fall of the Berlin Wall, traveled all over the region, and experienced life under Communism as few outsiders have. Upon her return to London and Canada (where her family lives), she mentions several times her tendencies toward hoarding food and supplies or being overwhelmed by selections in the grocery. I had fun reading about Viets' diverse stories and experiences. For someone who knew little about Eastern Europe around the collapse of Communism, I found the book to be extremely educational. She met all types of people and formed friendships with other journalists from around the globe. The stories, particularly those involving traveling from one country to another, left me in amazement at the freedoms I take for granted. We degrade Communism so easily, but I think we often forget the nitty gritty details of life under the regimes which make it so destructive. Viets has a wonderful story to tell and has clearly lived and exciting life. While I learned a lot, though, I found her writing to be very stiff. It appears that years of writing for news reports took their toll on her style. She writes as though sending a report of facts, a style which does not lend itself well to a memoir. It is clear that Viets spent most of her life writing for international political news stories, not human interest ones. The heart is there under the layers of facts, you just have to be willing to read between the lines to connect with it. What recent history would you like to learn more about? Do you feel like you missed a whole section of history in school because it was too recent?